Ian Rickson’s classy revival of Pinter’s cryptic play Old Times had a limited (Jan-April) engagement at the Harold Pinter theatre in London earlier this year. Locked away in a secluded farmhouse, Kate, Deeley and Anna reminisce about early days together in London. But, with conflicting memories and underlying sexual tensions, the past suddenly feels vividly present. 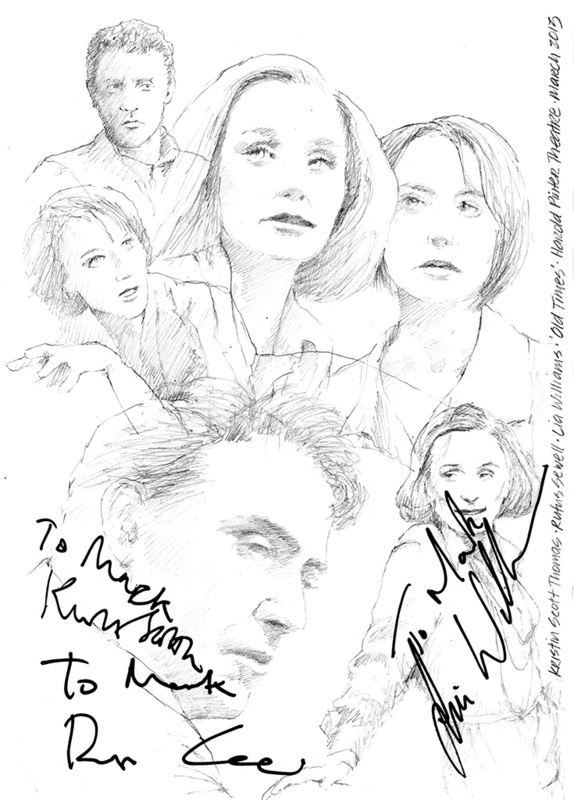 This entry was posted in Celebrity, Theatre and tagged Autograph, Drawing, Harold Pinter, Ian Rickson, Kristin Scott Thomas, Lia Williams, Old TImes, Rufus Sewell, Signature, sketch, Theatre by Mark Winter / Chicane. Bookmark the permalink.